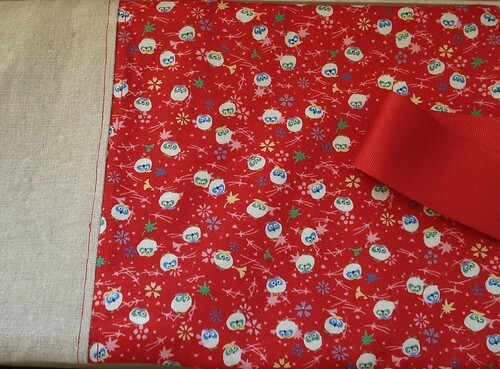 Mum’s very special heat bag for Christmas, with owls for wisdom and red because Mum loves red (and owls!). 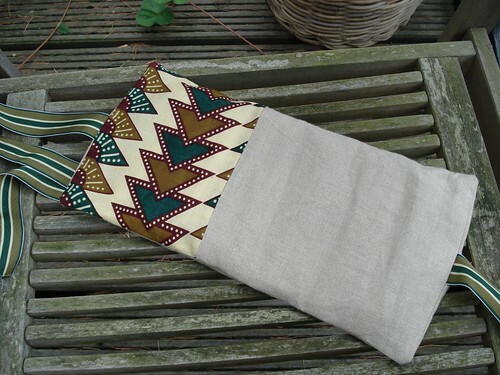 I’ve cut one my very much loved african fabrics to make this – a heat bag! I have a lot of back tensions and I also have occasional belly pains and of course heat relieves most of it! I started off by using a hot water bottle, which only worked for the belly. I then got an amazing cuddly wheatie toy – Iorek – which is much better; there is only one problem with it – I can’t use it outside the house, namely in work! So recently I decided I would make my very own heat bag, discrete enough to use anywhere. Googling away for tutorials I came across two that became the basis of my project – this one at Sew, Mama, Sew! and this one from And sew it is. For measurements and final look I used the first one; from the second tutorial I used the clever idea of splitting the inside bag in smaller compartiments; and then I added my own details – a ribbon so I could keep it in place while I mve around doing other things (busy busy) and the closure at the back, which is a pillow sham and not done with velcro. The plain fabric is a very soft linen cotton. For the filling I used a mix of brown rice and buckheat with a few drops of lavender oil. And there you go, my very own heat bag with a touch of Africa!